This is my attempt to solve the mystery of Happy Harold and put together a detailed story on him. A couple of people contacted me and shared some real nice memories. Anyone out there with more info? Pass it along! Happy Harold Thaxton was one of the few country DJs in the greater Miami area and one of the most popular radio and TV personalities all over southern Florida back in the 1950s and 1960s. Although many people seem to remember him, his career is still largely obscure. As I mentioned before, biographical facts about Thaxton are hard to come by. It's not known where Thaxton came from and when he began his career as "Happy Harold." Nevertheless, I'm quite sure his full name was Harold J. Thaxton, born in 1918. He was married to Anna Thaxton, who was born in 1929 in Hungary as Anna Kreuter. She immigrated to the US in 1949. They had a son, who died in a car crash in the early 1980s. After Happy Harold's death sometimes before 2000, she worked for a US senator before retiring. In the late 1940s and early 1950s, Thaxton was a member of Uncle Harve's Ragtime Wranglers, a group that performed on WWPB in Miami. In 1948, the group began recording for the Red Bird label out of Fort Wayne, Indiana. How this Florida group ended up on a Indiana label is a mystery to me. 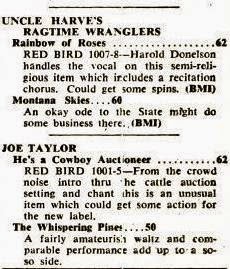 The first record was "Rainbow of Roses" b/w "Montana Skies" with Harold (Lazy) Donelson on vocals and Thaxton doing the recitation on the A side. Two more records for the label followed in 1951. Red Bird re-released its records over the years. In 1954, Thaxton worked with "Uncle Martin" Wales, a radio announcer for more than 20 years back then. That year, Wales started a new television show called "Sunset Ranch" on WITV that featured local Miami singers and musicians. Thaxton, "the one with the painted freckles and blacked-out teeth," led the show's house band, as stated in an article published in "The Miami News" on April 11, 1954. The band also included Harold (Lazy) Donelson on fiddle. Thaxton would appear with a guy called "Slappy" and they performed some kind of a comedy act. Artists that appeared on the show included Slim Somerville, Mrs. Henry Turner, James E. Thorpe, Johnny Burns, Molly Turner, Elaine Rouse, Rita Winters, and Jimmie Martin. Several of the artists were at one time or another members of Thaxton's band. Also Charlie McCoy and his group as well as Vulco recording artists Billy Eldridge and the Fireballs appeared on the show several times. However, by 1955, Thaxton produced his own barn dance show called "The Old South Jamboree" on WMIL, which was held Saturday evenings from the porch of an old parking lot. It was probably Mun. Auto Sales' lot on NW 36th Street, where he also had parked a Volkswagon bus. This venue possibly also housed the Sunset Ranch and was owned by William "Alabama Bill" Lehman, who would go on the be a US congressman. Thaxton would do a regular afternoon radio show from the back of that bus, too. The Old South Jamboree was on air as early as 1955 and was held at least until 1958. Another witness remembers he attended dances hosted by Happy Harold at the old Dade County Armory at 7th Avenue and NW 28th Street. "He was there every Saturday night for years," as he remembers. The armory building is now gone and was replaced by a seafood restaurant. I knew and worked with Happy Harold in the early sixties. I guess the first time I met him was probably when I stopped by his radio show one afternoon to get him to listen to a demo record my band and I had recorded. He not only listened but played it on the air right then on the spot, even though it was only a demo. Happy Harold was so well-known and popular that the pharmacy on Palm Avenue and 41th Street in Hialeah, where Harold would eat breakfast, had a sign on its restaurant counter telling people "Happy Harold Eats Breakfast Here." But his popularity was not limited to the Miami area. His radio/TV shows were broadcast all over southern Florida and he booked many artists on his stage shows across the Sunshine State's south. Kent Westberry, who worked with Happy Harold in the late 1950s and knew him quite well, remembered that Happy Harold also recorded a 45 disc for Harold Doane's country label Perfect Records in Miami. One of his band members, Mike Shaw, also cut a single for the same label. It seems Harold worked with quite a lot artists. In the early 1960s, Harold ran for city council but wasn't elected. One reason could have been the fact that everyone knew Happy Harold but no one knew Harold Thaxton, as he was presented during the election campaign. In 1964, Thaxton joined WIII in Miami along with another veteran country DJ, Cracker Jim Brooker. By 1968, Harold was working at WOAH on 71th Street in Miami, a country station previously known as WFEC. Harold recorded a lot of commercial spots at that time for such companies as "Mr. King's Pony Farm" and "A-1 King Size Sandwiches." WOAH shortly thereafter changed its format, aimed at a Latin American audience. What happened to Harold afterwards is not known (to me, at least). Thanks to Anna, Russ, Jim, Virginia, Charlie, Terry, Jack. I remember attending dances hosted by Happy Harold (I don't know if they were his "Jamboree") at the Dade Country Armory, 7th Avenue & 25th Street NW in Miami. He was there every Saturday night for years. his name was Slappy. The two of them, Happy and Slappy, would dress alike when they played together. What a sight they were, big baggy pants with suspenders, plaid shirts, big (shoulder to shoulder) polka dot bow ties, freckles all over their faces and a few blacked out teeth. And they could really play. Thanks for the great story on Happy Harold, I remember him well. There is only one thing I would question, I don't believe there ever was a radio station WMIL in the South Florida market. Happy worked for a long time for WMIE in Miami, amoung other stations, WWOK is the first that comes to mind. Great article though, I'll never forget Happy Harold. Thanks! It mentions Bill Phillips was on the Old South Jamboree on WMIL and a TV show called "Granada Club" on WMIL-TV. Nevertheless, you are probably right. The only WMIL station I found was licensed in Milwaukee. By the way, do you have any phots of Happy Harold? Happy Harold was a d.j. and did many commercial spots for station WOAH, 1220 on the dial, Miami, Florida, during 1968 when I was beginning my Miami radio career. The station was located on 71st Street, just off Biscayne Boulevard. I dont have air checks or photos, worse luck. The station was previously WFEC and after a short stint in the Country and Western format (six days a week with ethnic formatting on Sunday), it changed hands and format aimed at a Latin American audience. I remember spots Happy Harold recorded for "Mr. King's Pony Farm" and "A-1 King Size Sandwiches". My name is Bill Spivey and I am Uncle Harve's son. I grew up knowing Happy and most of the people that you mentioned in this article. If you would like to contact me I can supply you with information and pictures back when Happy was in my Dad's band,"Ragtime Wranglers" and other picture's.